A complete anti-aging skincare set for men and women. 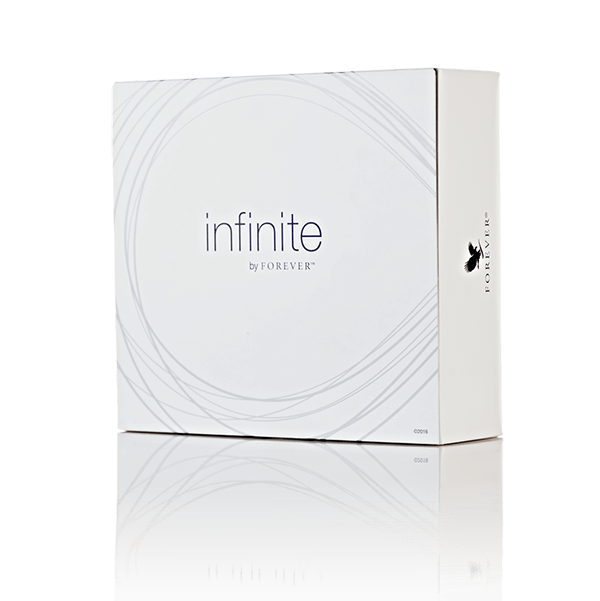 Infinite by Forever is a complete anti-aging skincare set for men and women. The set contains four products that work together perfectly: hydrating cleanser, firming serum, restoring crème and firming complex. This powerful skincare helps reduce the appearance of fine lines and wrinkles and gives a radiant, hydrated skin. Infinite by Forever is based on aloe vera and is reinforced with various plant extracts. While creating the formulas we used the latest skin technology. With infinite by Forever you will see and feel the difference! Hydrating cleanser is a mild and milky, fragrance-free cleanser. The product contains naturally derived ingredients like apple extract and apple amino acids. These ingredients increase skin hydration and make it easy to wash away dirt and oil. It contains Sunflower oil, is rich in linoleic acid and Vitamin E and Sodium cocoyl glycinate, a mild surfactant that is both hypoallergenic and non-irritating, leaving your skin feeling soft without drying. Firming serum helps reduce the appearance of fine lines and wrinkles. It supports hydration, elasticity of the skin and gives a fresh look. It contains Trifluoroacetyl Tripeptide-2 to increase the firmness of the skin. Hydrolyzed sodium hyaluronate is a substance that supports hydration and the skin-caring effect. Yeast extract helps supports the natural production of collagen. It also helps to reduce the appearance of uneven skin tone. Whey protein revitalizes the skin by improving the smoothness and firmness. Firming serum is fragrance free. Restoring crème contains several ingredients with moisturizing effects, like squalane, jojoba esters, glycolipids and beeswax. Acai and pomegranate make the skin feel smooth. The Centipeda Cunninghamii plant works synergistically to enhance the many benefits of aloe. Together these ingredients smooth the skin. Vitamin B3 and beetroot support the texture of a young looking skin. A blend of essential oils helps replenish the dry skin. Restoring crème is fragrance free. Firming Complex is an exclusive beauty supplement aimed at reducing the effects of aging on the skin from the inside. The tablets contain a good mix of French melon concentrate, phytoceramides (wheat lipid extract) and marine collagen. It reduces the visibility of wrinkles and stimulates hydration and the flexibility of the skin. Powerful phytoceramides complement the ceramides present in the skin naturally. Ceramides support hydration, for a radiant and young looking skin. Firming complex is gluten free. The set contains a brochure with detailed information about the products.